It was the sound of the Rickenbacker 360-12-guitar that encapsulated the sound of the 1960’s for many. The ringing bell and sustained tone of the Rickenbacker twelve strings (and six strings) are as notable for guitar aficionados as a rare bird call for an ornithologist. 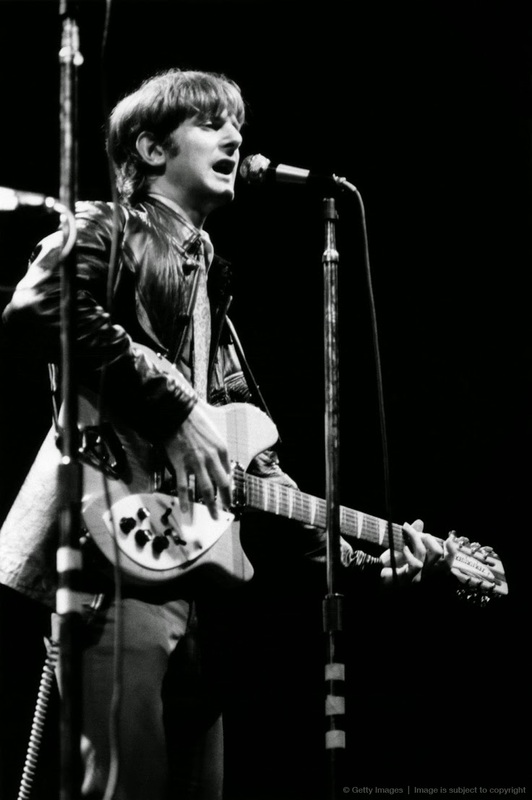 In 1964 after watching George Harrison play a similar model in the film A Hard Day’s Night, folkie and aspiring electric guitarist Roger McGuinn purchased a Maple-Glo Rickenbacker 360 twelve string guitar for his own unique brand of ‘electric folk music’. By chrome coating traditional folk melodies in electric attitudes this simple guitar purchase would turn the tides of popular music in the 1960’s. Today the ‘rock room’ takes a look at this iconic guitar and its handler. The definitive early ‘Byrds’ tracks ‘Turn, Turn, Turn’, ‘Mr. Tambourine Man’, ‘Feel a Whole Lot Better’ , ‘Bells of Rhymney’ are only a few of the many recipients of McGuinn’s chiming and resounding guitar tone. Already well familiar with performing on twelve string acoustic guitars as well as playing banjos, McGuinn immediately developed a unique signature tone on guitar, a sonic fingerprint completely unique from any other guitarist. 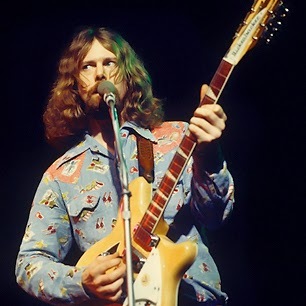 While McGuinn was not in the class of say an Eric Clapton, his folk sensibilities and knowledge of electronics and sound enabled him to develop a unique approach to his playing while conjuring a special aural personality. The Rickenbacker 360-12, then the 370-12 assisted McGuinn while he revolutionized rock and folk music as well as the sonic expression of 1960’s electric guitars. In addition, the use of Rickenbacker’s by the Beatles, Who, Searchers and then McGuinn’s own Byrds’ also helped the guitar’s namesake company to become one of the biggest in the world by increasing visibility and profitability. Every garage rock lad at least dreamed of holding a Rickenbacker. The name fit soon fit comfortably with contemporaries Gibson and Fender. The 360-12, then later the 370-12 guitars are both comprised of premium maple and rosewood and feature semi hollow body construction. The guitars weigh about 8lbs and have a 40’ length. Another special feature of the instruments is that the usual twelve string configuration of string pairs found on normal twelve string guitars was reversed to a player would strike the low string first. Rickenbacker also streamlined the head stocks on their twelve’s by mounting the tuning pegs on the back and side of the head. There was/is four volume/tone knobs in addition to Rickenbacker’s ‘5th knob’ that usually controlled the middle or neck pickup also dependent on any custom wiring. McGuinn fell in love with the instrument and it became inseparable from him, acting as the perfect disseminator of his art.The Rickenbacker’s slim and sleek rosewood neck and low action allowed McGuinn to include his folk guitar techniques in an arena that not only suited his abilities but expanded the frontiers of rock music. One development to the original Maple Glo 360-12 was McGuinn’s installation of a third pickup to the original two pick up setup. 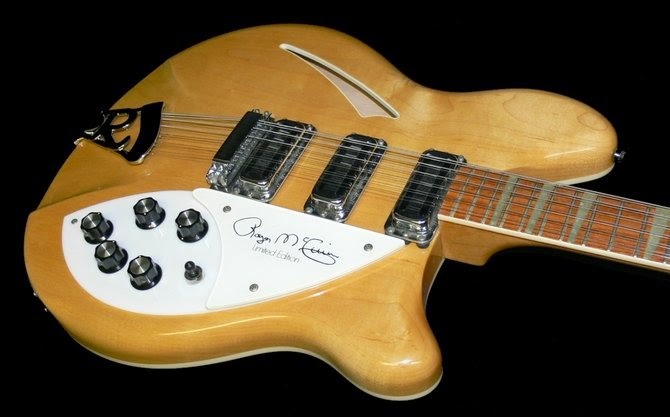 This was also a feature added to the Rickenbacker that was custom made for McGuinn after his original Maple-Glo was stolen in 1965/66 after a show. The following 360-12 replacement guitar was updated, offered three 'Toaster Top' pickups and included some additional modifications to McGuinn’s specifications including some unique wiring configurations. McGuinn has stated that the original 360-12 was the guitar that played the iconic openings of ‘Mr. Tambourine Man’ and ‘Turn, Turn, Turn’. He also stated that these musical statements were played only using the treble pickup of the guitar and the tube driven compression of Columbia Studios. Compression is the key to the Rickenbacker’s sustain per McGuinn who had his later signature guitar fitted with an on board compression rig to arrive at his unique tone. In the early days McGuinn only used a Vox Treble Booster ‘jimmy-rigged’ into the instrument and a rack unit compressor for any sort of on stage compression. He also employed flat picks as well as finger picks for unique soling as can be found on the jagged guitar introduction of ‘Eight Miles High’. The 370-12 that replaced McGunn’s stolen 360-12 was also unfortunately taken at some point and replaced with another Maple Glo 370-12 that McGuinn still owns and plays today. McGuinn currently has a signature edition guitar that is offered by Rickenbacker, a testament to his revolutionary ideas, his extraordinary talent and his prowess regarding the instrument. Both Maple Glo 370-12’s and Fire Glo 370-12’s are now synonymous with McGuinn, his tone forever echoed down the stone halls of rock. Who knows how many Rick’s he has acquired over the years? What is certain is that like Hendrix’s ‘Strat’ and Lennon’s own Rickenbacker the instrument he made popular is now as recognizable as he the musician. The Rickenbacker 360-12/370-12’s unique construction and reverberate ‘jingle-jangle’ tone helped to create and disseminate an entire sub-genre of rock music. 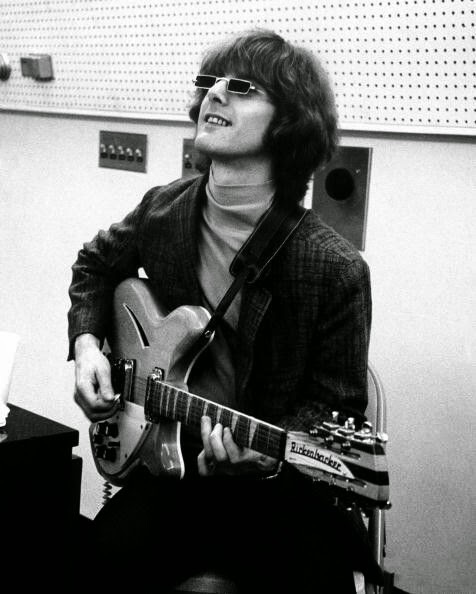 Roger McGuinn, after being influenced by the Beatles and Searchers, implemented his sonic ideas and dreams through the Rickenbacker and in the process created a long lasting musical identity and legacy.